There's a new CAS challenge at Outlawz Challenes and it's all about humor. The challenge is hosted by the very talented Linda Anderson and here is her challenge. April is National Humor Month. Laughter is the best medicine. It's infectious, and far more contagious than any cough, sniffle or sneeze. Let's make a CAS card this week filled with humor, a joke, or something punny. 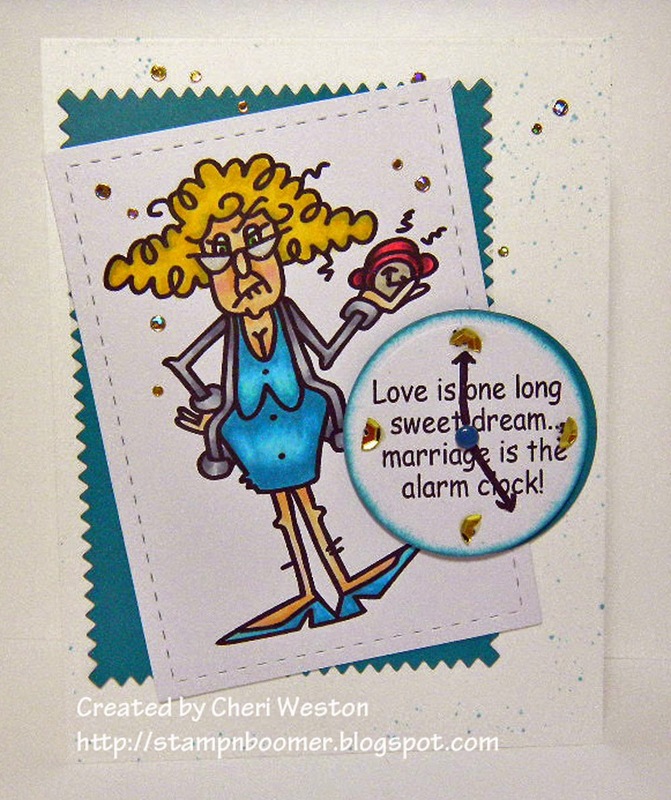 Here is a card I made for the challenge using this Bugaboo digi. I don't often use digi stamps because I have a healthy (understatement) collection of rubber and clear stamps and love using them. That said, the sponsors for some of the CAS challenges have been digi stamp companies and I wanted to try using them in an effor to support their sponsorship. I have to say, these stamps are really fun to use. My image can been seen here. I printed it on Copic Xpress paper and colored with (my favorites) Copic markers. I hope to see you playing in the challenge. You have until mid-night Saturday, April 18 to play and enter into the drawing for some awesome prizes. Thanks so much for stopping by and I hope you have a fabulous week. What a fun card SS. Great digi.LOL here. Cheri- this is so cute!